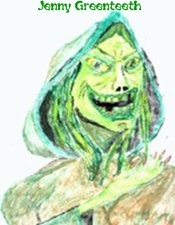 One of the advantages Greenteeth Multi Media has over its more conventional rivals is the ability of our CEO (Chief Ectoplasmic Officer) Jenny Greenteeth to use her supernatural powers to bring us stories flesh and blood newsgatherers could not get near. For example, to obtain this recording of a private conversation in the Royal bedchamber on the morning of The Queen's 80th birthday, Jenny was able to diguise herself as the foetid water in a vase of flowers. Inside Windsor Castle, in the breakfast room. Philip! There appears to be a large number of chevs iteside the carstle. What are they doing here? They are your subjects dear, they want to wish you a happy birthday. Well ay don’y like them, they are common. Ay cannot enjoy may breakfast with common people hanging arind. Footman; fetch me some brine sauce for may bacon sarni. Leave them dear, they are doing nay harm, they only want to wave flegs and sing your song. That reminds me Philip, Ay want a new song. Ever since that Johnny Elton fellow wrote Candle in the Wind for Diana, “God save Our Gracious Me” has sinded very dated. Ay want Paul McCartney to write me a song. But before you arsk him, get rid of these common people. Tell them may birthday is not until June. But it is your birthday. Your official birthday is in June. Oh; thet’s rayght, Ay get two birthday’s because Ay am the Queen. So shall Ay leave the subjects then? Certainly not! They’re frightening the Corgis. Besides, Ay know what they want, they’re arfter pieces of may cake. Elizabeth dear, hundreds of people have sent you birthday cakes, we shall never eat it all on our own. We can give them some surely. Don’t call me Shirley. Daddy told me abite cake when he was teaching me to be Queen. “Lillibet,” he said, “you must never let the poor eat cake, it causes no end of trouble. Ay never quayte knew what he meant but Daddy was always right. Send those people orf to get burgers from the van in the car park. Oh very well (DOOR OPENS) Now listen here you lot, the Queen is not going to talk to you and you are not getting any cake. Now fack orf you common fackers.